This tiny baby girl was found in a London park in a supermarket shopping bag. In freezing temperatures with only a towel around her, she still had her umbilical cord attached. Medical staff have named the abandoned newborn baby Roman after the road where she was found. Her desperate cries in the night – heard by a woman walking her dog – are what saved her. A search is now on to find the abandoned baby’s mum and ensure that she’s safe. Police are urging the mother to come forward and anyone else who may have information about who she is. Rima Zvaliauskas was walking her dog late last Thursday evening in East Ham (Newham, London) when she heard strange noises. They were coming from a bag lying on the ground in the snow. It was next to a park bench in a play area off Roman Road. The former midwife and her son Lvidijus told the BBC they were terribly shocked and distressed after discovering the newborn baby abandoned inside the bag. “My mum at 10 o’clock in the evening was walking the dog and she heard a noise coming out from a bag. She rang me up because she was too scared to approach the bag. When I came I just found the baby in the bag and we phoned the ambulance and the police,” said Lvidijus. Little baby Roman was abandoned in the snow – image courtesy of Metropolitan Police/PA. The helpless newborn had a frosty forehead and her umbilical cord still attached. Wrapped only in a towel for protection, she was left out in the open in the bag, in freezing, snowy conditions. Lvidijus thought she might have been outside for about 15 or 20 minutes. “She just had a blanket on her and that’s it – in a Sainsbury’s shopping bag,” said Lvidijus, who has described the incident as unreal. 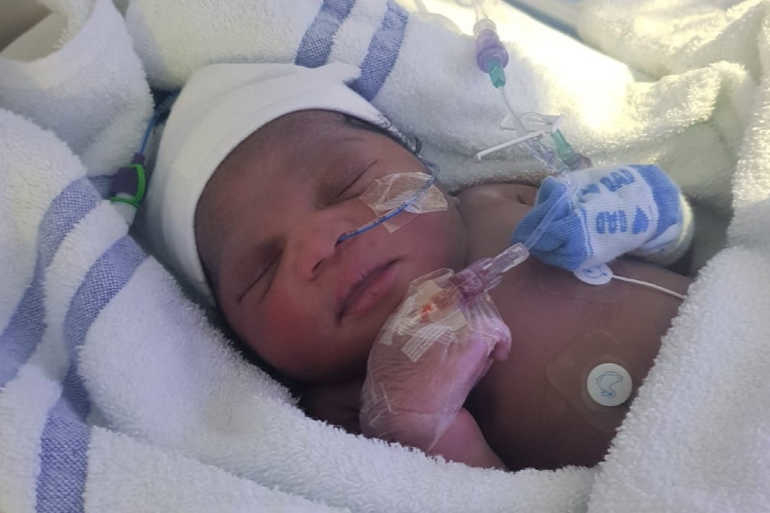 Thankfully the abandoned baby was quickly taken to a hospital in East London. She is currently recovering and in a stable condition. Medical staff say baby Roman was only 30 minutes old when found. While bub appears to be doing fine for now, police are concerned for the wellbeing of the mother. There is speculation that she actually gave birth in the park in the freezing conditions before abandoning her baby. So she may need medical attention. As the BBC reports, she’s being urged to contact police, her local hospital, a GP or the London Ambulance Service (LAS). We’re so relieved that people found little Roman before it was too late. We wish her the best recovery and hope that her mother turns up safe and well soon. Sadly, many mothers abandon their babies after giving birth, like this newborn left at a bus stop. If you or anyone you know is pregnant or has given birth and needs help, please call 000, Lifeline or PANDA.